^ Sheppard, Scott S.; Trujillo, Chadwick A. (June 2006). "A Thick Cloud of Neptune Trojans and their Colors" (PDF). Science. 313 (5786): 511–514. Bibcode:2006Sci...313..511S. doi:10.1126/science.1127173. PMID 16778021. Retrieved 2008-02-26. ^ Wright, Alison (August 1, 2011). "Planetary science: The Trojan is out there". Nature Physics. 7 (8): 592. Bibcode:2011NatPh...7..592W. doi:10.1038/nphys2061. Retrieved 2011-08-12. ^ Connors, Martin; Wiegert, Paul; Veillet, Christian (27 July 2011). 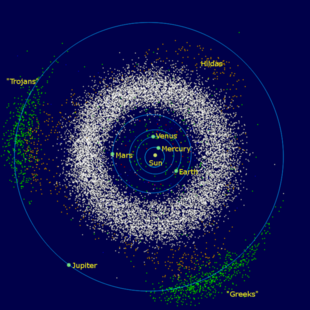 "Earth's Trojan asteroid". Nature. 475 (7357): 481–483. Bibcode:2011Natur.475..481C. doi:10.1038/nature10233. PMID 21796207. Retrieved 2011-07-27. ^ Powell, David (30 January 2007). "Neptune May Have Thousands of Escorts". Space.com. Retrieved 2007-03-08. ^ Choi, Charles Q. (27 July 2011). "First Asteroid Companion of Earth Discovered at Last". Space.com. Retrieved 2011-07-27.